If you’re searching for a vacation rental home on the Outer Banks that offers easy access to both the seashore and an assortment of attractions and amenities, look no further than NJOYN Life! This four-bedroom oceanside home is located right in the heart of Nags Head and provides something everyone in your party will enjoy during their stay. When you spend your upcoming Outer Banks vacation at this beautifully decorated residence just one block from the beach, you’ll be just steps away from the shoreline of the Atlantic Ocean and only moments from putting your toes in the sand. Make a cup of your favorite coffee using the Keurig machine in the fully stocked kitchen and step outside onto the top-level deck that features partial ocean views to watch the colors of the sky change as the sun rises out of the water. Then grab your beach towels and boogie boards and head down the street to the beach to soak up the sun, surf and sand until the sun goes down. In addition to being just a six-minute walk down the street from the beach, NJOYN Life features a private swimming pool in the fenced backyard so you can cool off after a hot summer day of fun in the sun or lounge in a chair to read a book and work on your tan. The bubbly hot tub at this Nags Head home is the perfect place to relax and unwind in the evening hours as you enjoy a cool ocean breeze—especially after an afternoon spent enjoying popular outdoor activities ranging from kayaking and kite boarding to surfing and standup paddle boarding. 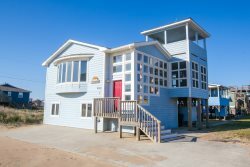 Guests of NJOYN Life will never have a shortage of options for entertainment during their stay at this Nags Head vacation rental. The ground-level game room features a large air hockey table as well as a mini fridge and flat-screen TV so your family can enjoy an evening of friendly competition and some quality time together. Once you’ve worked up an appetite, head to one of the dozens of local Outer Banks restaurants that are conveniently located within minutes of your home away from home. Catch an incredible sunset over the Roanoke Sound at Miller’s Waterfront Restaurant or Pamlico Jack’s Restaurant and Bar—both of which are just a two-minute drive from NJOYN Life. Other nearby restaurants include The Dunes Restaurant and R Bar, Sugar Creek Seafood Restaurant and Sam and Omie’s. If you want to cook your own fresh seafood at home, swing by Whalebone Seafood Market to pick up some fresh fish, shrimp or scallops to toss on the charcoal grill in your backyard for a homemade feast. If you’re craving some sweets after dinner, stop into Scammell’s Corner Surf Shop and Ice Cream Parlor—which is less than a quarter-mile from NJOYN Life—for a tasty treat at this family-owned establishment that offers more than 50 flavors of ice cream and singing servers. Outdoor adventurers will love the fact that NJOYN Life is situated close to a variety of attractions, including First Flight Adventure Park—an amusement facility featuring aerial obstacles of varying difficulties and several zip lines—as well as a go-kart speedway and an 18-hole miniature golf course that are both right across the bypass from your vacation home. With its location just steps away from the Atlantic Ocean and numerous Outer Banks attractions, you’re sure to make memories here that will last a lifetime. Book your stay today at this oceanside Nags Head home today, and get ready to start “NJOYN Life” on the Outer Banks of North Carolina! Ground-Level: Game room w/ mini fridge, day bed, air hockey table, microwave, and laundry area w/ half bath.